Gov. Tanko Al-Makura of Nasarawa granted Amnesty to a 17-year-old nursing mother on Saturday and eight other prison inmates on grounds of age. Al-Makura granted the pardon when he visited Lafia Prison as part of the activities to celebrate 20 years of the creation of the state and the country’s 56th Independence Day celebration. The governor, who was represented during the amnesty by the Attorney-General and Commissioner for Justice, Alhaji Yusuf Usman said that the Amnesty was in accordance with the 1999 Constitution (as amended). He said that the gesture was part of the activities lined up for the country’s 56th independence celebration and the 20th anniversary of the creation of Nasarawa. 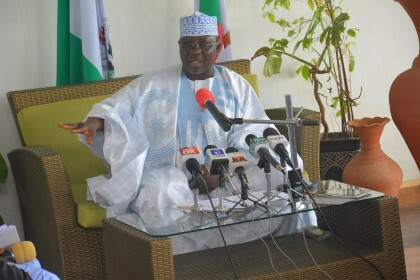 Al-Makura added that the exercise was carried out based on the recommendations of the committee on prerogative mercy. The governor said the gesture was to decongest the prisons and give the inmates a sense of belonging and the opportunity to contribute their quota positively to national development. “Today, on behalf of the Nasarawa State Government, I am freeing nine inmates from the five federal prisons in the state. “This is part of the state government’s support to President Muhammadu Buhari’s efforts in decongesting the prisons as well as to make the inmates responsible members of the society,” Al-Makura said He reiterated his administration’s commitment to partner with the ministry of interior in improving the conditions of the prisons. The governor said that he was particularly touched by the case of the nursing mother who gave birth to the baby 10 months ago. He said that since the offence was committed by the mother, the innocent baby who did not know anything should not be in the prison. “The 17-year-old nursing mother, Justina Musa, who was convicted for joining a secret society, was reprieved of her one-year sentence under the prerogative of mercy, while eight other inmates are at ages ranging from 12 to 20 years,” he said. Earlier in his remark, the Comptroller of Prisons in the state, Mr. Ekwere Ekanem, said that the Lafia Prison was designed to accommodate 300 inmates but was currently congested with 614. He explained that out of the number, only 92 were convicted while 523 were awaiting trial. Ekanem appealed to the state government and other relevant agencies, especially the police and the ministry of justice, to speed up the discharge of criminal cases. He added that a total of 1,690 inmates were currently in the six prisons in the state. Of the nine inmates granted amnesty by the governor, six were serving their terms in Lafia while three were in Wamba.